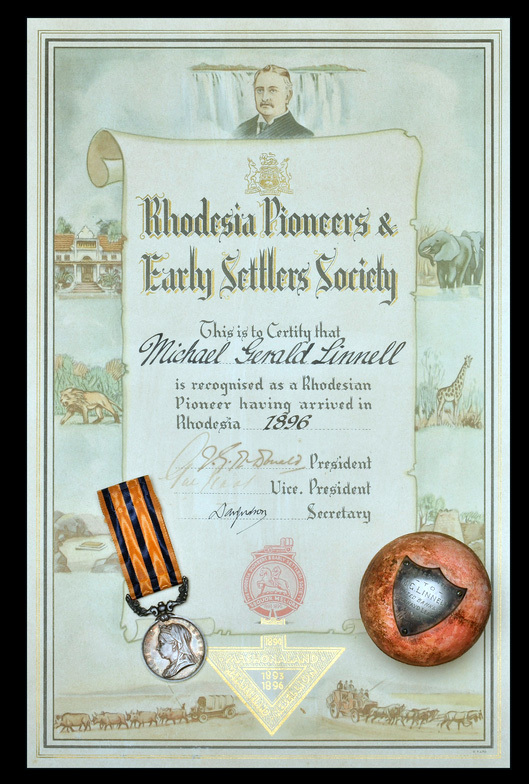 A rare original coloured certificate from the ‘Rhodesian Pioneers & Early Settlers Society’ certifying that “Michael Gerald Linnell is recognised as a Rhodesian Pioneer having arrived in Rhodesia 1896”. Together with a cricket ball with applied silver shield inscribed ‘Presented to M. G. Linnell / United Banks C.C. / Bulawayo League / 5/11/04 “Hat Trick”. Michael Gerald Linnell arrived in Rhodesia in 1896 and served as a Trooper in the Matabeleland Relief Force during the rebellion that year. He was the grandson of John Linnell, the prominent British landscape artist, and the son of James Linnell who was also a recognised artist.